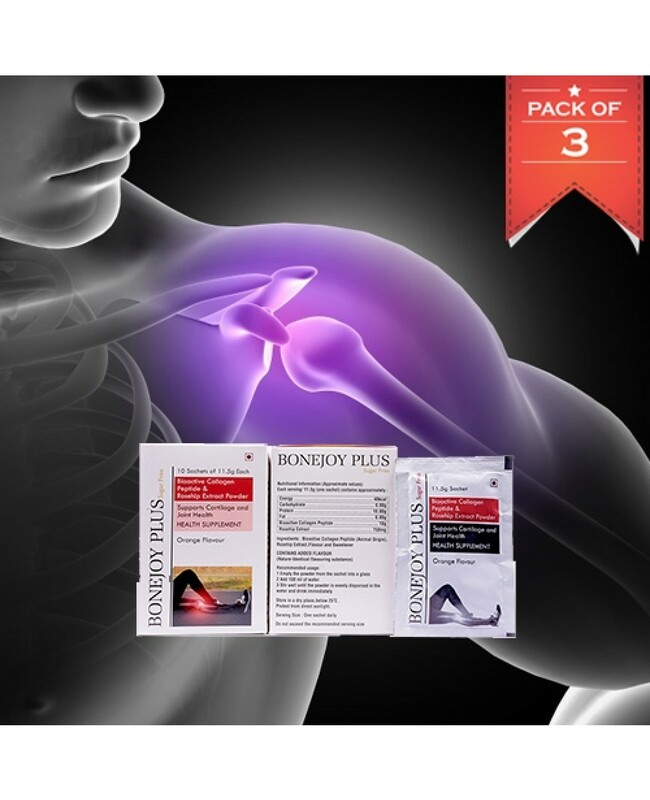 BONEJOY PLUS is a combination of Rosehip Extract and Collagen Peptides in the form of Sachet. Rosehip extracts are described to have an anti-inflammatory potential. It contains active compounds, which helps in maintaining joint motility. Rosehip is used as a source of vitamin. Collagen helps to give strength to various structures of the body and also protects structures like the skin.It prevents absorption and spreading of pathogenic substances, environmental toxins, micro - organisms and cancerous cells in the body. In short, Collagen protein is the cement that holds everything together. Orally administering BONEJOY PLUS SACHET having collagen peptides may provide beneficial effects on bone metabolism, especially in the calcium-deficient condition such as osteopenia. BONEJOY PLUS SACHET with collagen peptides may be effective on bone metabolism by inducing differentiation and maturation of osteoblast and stimulating their activity. Bone turnover is thus modulated, by preventing bone resorption during the natural process of bone loss (osteopenia) and increasing bone solidity. Collagen makes up to 90% of bone mass and therefore BONEJOY SACHET PLUS is likely a key factor in improving bone health. ROSEHIP EXTRACT may be effective in relieving some symptoms associated with rheumatoid arthritis and osteoarthritis. ROSEHIPS EXTRACT is thought to have more vitamin C than an orange or lemon. Vitamin C has antioxidant properties. Research shows vitamin C may help reduce ultraviolet light damage caused by free radicals. Vitamin C also supports collagen production, which helps reduce wrinkling. Finally, vitamin C may increase wound healing and help prevent dry skin. The anti-inflammatory benefits of ROSEHIP EXTRACT may make it a good option for people who cannot take non-steroidal anti-inflammatory drugs (NSAIDs) or other pain medicines. ROSEHIP EXTRACT has an intoxicating scent and is used in aromatherapy.